I have written before about Jack Zipes' suggestion that we not worry too much about what 'message' we are giving with a particular story - instead we should provide alternative versions of it and let them accuse each other. 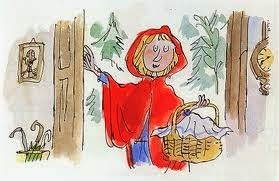 His classic example is 'Red Riding Hood' - it could be the classic anti-feminist tale (little girls: stay at home and keep safe!) but providing both matriarchal peasant versions and modern retakes on it (e.g. Quentin Blake's - right - who 'pulls a pistol from her knickers') alongside the Grimm version allows young people to decide for themselves. More than that - they get a distance and critical perspective on the story-making process itself, and start to be able to use it for their own purposes, and to critique society. I have gradually and painfully come round to this, having been reluctant to open stories up to such postmodern dissection. Yet, Brechtian alienation and all that...I do know he is right. My preference has been to develop workshops where, rather than presenting versions of the same story, I have told different stories within a similar structure, such as the 'hero's journey' - both mythical and contemporary true stories. I have helped groups look for the similarities and differences between these and find a structure they can play with. We've then created a character together, who in some way represents the group or its fantasies. This character is then sent off on its own story, either by all the group together or each member individually. These have been some powerful experiences for groups, and generated some tremendous stories. But you never get to sit still for long in this research game. On Tuesday I was privileged to attend a brilliant event at my university, York St John, organised by my supervisors Matthew Reason and Nick Rowe. It was called 'Elusive Evidence' and focused on challenges of documentation and research in applied arts practice - that is, arts in social, health, educational settings. Run as an 'open space' event, there was plenty of time to discuss with the many stimulating speakers. One of these talks raised a question for me, which we later explored in discussion. Olivia Sagan (of Bishop Grossetest University) spoke about the potential for doing harm with our work. It's always possible to see an intense response by a group, and assume this is a good and beneficial one. Groups I have worked with have certainly produced strong, creative, moving work fed by stories - but might processes like the one I have outlined have risks as well? Creating a marginalised character to represent a marginalised group of young people might be a horizon-limiting thing - strengthen the bonds between them but make them feel more cut-off from others. Yesterday a group of 13-year-olds told me their character was 'quite happy living alone with his animals' and did not need to go anywhere or find new friends. What are the answers to that? I think Zipes would say, don't sweat it, give them another story! Let it be a contrasting one which questions the last one. It can be hard to escape from the 'hero's journey' myth in this age of Disney - find something else, let it be subverted. And I think forum theatre practitioners would say: stick with it, but let the young people explore all the perspectives in the story, not just that of 'their' character. Let them put their character in tricky situations. Celebrate the conflicts in the story. Why is god punishing us? What stories do teenagers tell?